now today i will tell you how to download install filza file manager free of cost in your ios device. 1st i will telling you what is filza file manager app. this app is storage device you can store any thing, create zip and rar file and send any app to other one. if you want to install this app first of all you know very well you want your device access to install any app without jailbreak. now 1st install cydia click on this cydia link. and install when you complete to install cydia. check below steps. 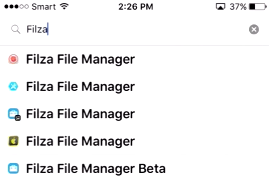 how to install file manager in your apple device. you can use this app to compress any large file any app withing seconds and send to anyone. there are store zip files, rar files, music , games, apps images. quick to send other ios device. download and install cydia in your ios iphone/ipad device this is most important want in your iphone for installing file manager. click on cydia and open when complete this all download and installing work. tap on the search option bar, and search which you want, now i want to install filza file manager and search it. you can see many file manger and i want filza only. now you can select open filza file manager cracked version and click on install button. which can you show right corner. you know also very well how to download app. now you want to confirm. also check your device storage memory before installation and settling. you want allow all setting for installing any third party app in device. this app want some time for downloading and installing automatically in background. also i tell you one thing don't click on any side and don't use phone when you device in progressing. other wise this is very risky its will crash and your all work is loss. don't to worry wait some time when is complete you can use any thing first complete it. now you device is refreshing and reloading this sign of completing installing of app. now your done again open cydia app and open again filza file manager premium version in your any ios device. now you are done installing app. go back to you ios device home screen or menu screen. there are you can see filza file manager app. now you can open it and use and enjoy it friends. Now All friends carefully install this filza app. you can install this app. 1st you want cydia. i am already first paragraph give you cydia link download cydia. then you can download any third party and paid apps in free of cost. also check my all images which i am upload in this post. they are very helpful to you for how to download and installing app. if you face any error problem you can comment here. i will always ready for help you.